Basketball has long been known as the “Big Men” league. Think Shaq, Michael Jordan, Lebron James, all very tall men who have been proven and are known to dominate the court. However, a new era in the NBA has come to light and that is the golden era of the point guard. In fact never before in basketball history has the court seen so many dominating guards. Where once it was the job of the point guard to bring the ball up the court and get it in position for their team to play offense and score, now instead these floor gods are striking out at defense and the ones making the scoring points. 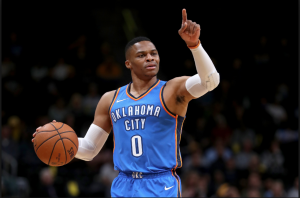 Think Russell Westbrook or Steve Nash…not known as some of the biggest players in the league by far, but well known for their scoring and magnificent playing abilities. Although we do have to agree that Golden State Warriors point guard Steph Curry is performing a bit slower and without as much polish and punch per is usual self we like to attribute that to the addition of Kevin Durant to his team. While the Golden State Warriors are already packed with MVP players and all-star picks, adding a big star like Kevin Durant to the team could be a little daunting. However, they aren’t deeming this the point guards golden era for nothing. In fact as we see more and more what these newfound point guard abilities can achieve it is probably safe to say that we are only beginning to really delve into how much of a punch the point guard position can pack. 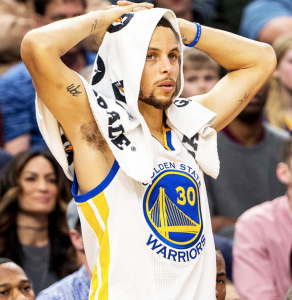 Besides Steph’s stats may be off to a slow start and a bit on the low side, but this Golden State MVP is still averaging 25 points per game. Give him some time to warm up to Durant on his team and I believe we will see him come out of his shell once again. Besides with point guards as dominating as they are on the court he will need to step up his game to be able to leverage any type of competitive edge on the opposing teams point guards. We know Harden, Ricky Rubio, and Westbrook won’t slow down for anyone. They have their eye on the prize….the NBA Championships. Let’s get it boys! Basketball is an excellent way to stay in shape, develop sportsmanship and athleticism, as well as actively involve yourself in your community. Being very active in basketball or any sport can wreak havoc on the body. Whether you faced with a common injury or really tight and over worked muscles running around a court may require a little body love and awareness. As the body engages itself to perform specific movements, the muscles contract. This constant contraction is what helps to develop the muscles and strengthen them specific to certain movements. This constant contraction is what also make them tight and even ache. Regular massage will not only help alleviate muscle fatigue and tightness, but also help improve athletic performance. “There are many massage styles to choose from”, says a deep tissue massage therapist in Fort Collins, CO and owner of Premium Massage Spa. We asked him what massage style is best for athletes, specifically basketball players. He said that a sports focused massage and deep tissue massage are usually the best options for athlete. Sports massage uses a variety of techniques and style to address the issues at hand. Being the muscles are constantly activated when playing sports, this massage style aides in getting the muscles to respond and relax to create space for better range of motion and movement. Deep tissue massage works deeply into the tissues of the muscles. When a muscle is used to being tight, the depth of pressure and strokes can help to release the muscle. Deep tissue focuses on using slow, long, deep strokes to alleviate tension, stress and fatigue. When choosing a massage therapist, Kingysa recommends asking what areas of massage they specialize. If you need a specific style, such as a sports massage or deep tissue, then he suggests that the therapist has expertise in that area. As you build a relationship with your massage therapist they will begin to learn your body and the way that it responds to bodywork. Massage offers more than just tension and stress release. Massage will also aid in improved blood flow and range of motion. Our blood carries the necessary oxygen and nutrients to tissues, muscles and organs of the body. Increase blood flow improves the amount of oxygen and nutrients the body receives. Oxygen and nutrients are essential parts of overall health and healthy body functions. 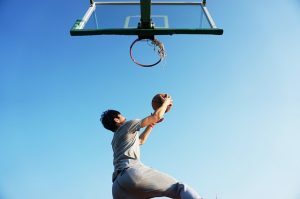 If you have sports basketball injuries, massage can also help with soft tissue strains and injuries. Massage truly offers a wide range of benefits. There is not a one size fits all style. A trained and professional therapist will offer their expertise in helping you to find the best massage style to fit your lifestyle and body needs. Enjoy the game and the recovery! Yes, yes, I know what you’re thinking. How many calories can I lose by playing basketball? But the thing is, obviously that’s not the only benefit of playing basketball. I mean, you’d lose weight with probably any physical activity. But when it comes to playing a sport, you’ve got to think beyond just losing a few measly calories. So, here are some of the health benefits of basketball. The most obvious and maybe even the most popular health benefit. Basketball is quite fast paced, it’s intense. So yes, it will help you lose weight. But again, you can’t expect *only* basketball to help you lose weight, and you can’t expect miraculous results. 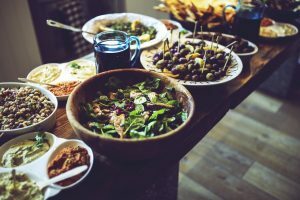 A good diet will form a major component of your weight loss program. If some sources on the internet are to be believed, you could lose about 550 calories an hour playing proper basketball on half court. Basketball is also a great way to work on your cardiovascular fitness. It helps build cardiovascular endurance. Let me explain this a bit. Cardiovascular fitness refers to the ability of the heart to pump oxygen rich blood to the muscle tissues that need it. Our muscles will use this oxygen for energy during sustained physical activity. Cardiovascular endurance could be thought of a measure as to how fit your heart is, and a measure of your stamina. The better cardio endurance you have, the more efficient the body becomes at using oxygen, and the lower your heart rate. Cardiovascular fitness will also reduce your chances of getting a heart disease or a stroke. 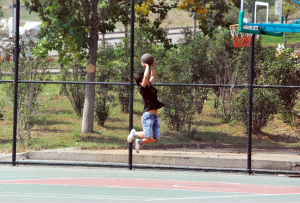 Basketball is a very good way to increase your endurance given its vigorous and intense workout. It’s also good for your bones! First let’s see what our bones are made up of. When you try and imagine a bone, you’re thinking of its outer shell – which is dense, hard, calcified material, and it’s called the matrix. This actually houses living cells inside, named osteoblasts, and osteoclasts. Osteoblasts are the productive guys, they keep producing new bone matrix. On the other hand osteoclasts are the slackers. They keep degrading the bone matrix. For the bones to become stronger and denser, the osteoblasts must produce the outer matrix at a faster rate than what is degraded by the osteoclasts. Basketball helps us in this. Because basketball needs us to run in short bursts, to jump and stretch, it stimulates the osteoblasts to produce new bone matrix in the legs, spine, and pelvis. Also due to the stress placed on the joints, the ligaments joining the bones become stronger. It helps you calm down! A team sport helps you socialize a bit. It is also a known fact that playing sports cheers you up, and hence you have a better immune system too. So, what are you waiting for? Start shooting some hoops! A history Lesson from Dave. Dave a concrete coatings and repair expert, as well as an avid basketball fan, has resurfaced many, many Basketball Courts. That being said, Dave gave us a little insight on the history of the game of basketball. Most sports that are played around the world today were developed by ‘accident’, and they evolved to become more sophisticated as the game progressed. In this regard, Basketball is different, because it was actually intentionally created by someone. Basketball was invented in 1891 by James Naismith, who was a physical education teacher at the YMCA Training School (now called Springfield College). His students were bored of just doing gymnastics and callisthenics during the long New England winters, and so James decided to come up with an indoor sport. Basketball was roughly based on a sport Naismith had played during his childhood, which was duck-on-a-rock. There was basically a target (duck), on an elevated rock, which had to be put down by throwing a ball or a stone at it. So, in its most basic form, there was the principle of Basketball – an elevated target, and a ball! In those days, Naismith’s students played basketball using a soccer ball, and 2 peach baskets which were nailed to the gym balcony railing, about 10 feet off the ground. The baskets had no holes at the bottom, so every time someone scored a point, the game had to be stopped for a bit to retrieve the ball. Later on, they made a hole through the bottom of the baskets. The first ever public game of basketball was played in 1892, at Springfield, Massachusetts. It had 18 players, 9 on each team. Injuries happen, especially when you fully immerse yourself into any type of sport. Although injuries are preventable, they still happen. As the name suggests, this is a tear in the ligaments of the ankle. A ligament is a short, tough fibrous tissue that connects two bones together. The ligaments around the ankle are responsible for keeping it in place. This title doesn’t really suggest much, so I’ll just go on and explain a bit. A tendon is a strong, fibrous tissue that connects muscle to bone. The Achilles tendon connects the calf muscles to the heel. A lot of running and walking will put stress on the lower end of the tendon, due to which the back of the heel will start hurting. Obesity and flat feet also contribute to this. Among other things, exercising in cold weather, not wearing proper shoes, will exacerbate the condition. Like most sports, even Basketball has quite a few variations. The central idea remains the same, but it’s just that there are different sets of rules for shooting a ball in a hole. Some of these variations are very close to the game of Basketball, while the others could be called distinct sports in their own right. The 4 games given below are essentially just simpler versions of basket ball, with the goal to get the ball in the basket. This is just basketball without any frills, plain and simple. In this version, every player plays for himself, there are no teams. The first person to reach 21 points wins. It needs a half court, at least 2 players, and a hoop. One of the players starts the game from the three point line. This player will try and score a basket, and the other players will play defence, i.e., they will try to stop him from scoring. If the player currently in control of the ball scores a basket, the game pauses, and he takes free throws from there on until he misses a basket. Once that happens, the next player in sequence plays offense, while the others play defence. Each basket can be for 1 point. And there are no fouls or out-of-bounds. This one’s a bit fancy. Again, you need at least 2 players, a ball, and a hoop. The game starts with the first player tries to score a basket in a predefined way. By that I mean that the player will first have to declare the kind of shot he intends to score. It could be a simple lay-up shot. Or he could say something like “Imma throw the ball with my legs while doing a somersault”. And then he goes on to do it (or tries to). Then the next player in the sequence attempts the exact same shot. All the players keep doing this until one of them fails to score a basket. Then that person is assigned a letter, starting with “H”. Then the next person declares the kind of throw he wants to attempt, and so on. If any person is assigned all the 5 letters (H-O-R-S-E), he’s out of the game. The last person left becomes the winner. This is the game which you can play to work on your shooting skills. You need at least 2 players, a hoop, and a half court. A player stands and takes a shot from 4-7 positions along the three point line, such that he forms a semi-circle. Hence the name, ‘Around the world’. The first person to score a basket from all the positions wins. If a player scores a basket from one position, he goes on to attempt a shot from the next position. If the player misses a shot from a particular position, the next player starts attempting his shots, and so on. If a player misses, he can continue from his last successful shot, whenever it’s his turn next. Okay, pay attention, this one’s a little tricky. And you’ll need 2 basketballs to play knockout. It needs 2 or more players, who will stand in a straight line behind a shooting line. The first 2 players will have a basketball with them. The first player shoots and tries to score a basket. The moment the ball leaves his hands, the second player can take his shot. The first two keep trying to score until one of them scores first. If player #1 scores first, he passes the ball to player #3, and if Player #2 scores, Player #1 is out. Assuming player #1 had scored first and the ball is passed to player #3, the game continues. Now, the earlier player #2 becomes the new player 1, and player #3 becomes player 2. This pattern continues until finally one person is left, and he becomes the winner. One of the best things for our youth today is sports. Whether it be through school or the community having our kids participate in sports is very beneficial to them in many ways. Not only does it teach them about working with others, it is good for them physically teaching them to be active and enjoy it at the same time. It gives them a sense of involvement and shows them how every little part of a team is important. In both New York and New Jersey where crime rate can be high and the city is filled with multiple ways of fast paced life, sports are even more so encouraged to help keep the youth of today headed down the right rode that will lead to success in life. Our blog follows youth basketball in the cities of both New York and New Jersey. Offering a direct line to different programs and clubs established for the kids in these cities that want to play basketball and succeed. Especially those going to high school and preparing for college. Being involved in a sport can lead to college recruitment and even scholarships that will aid in the cost of expensive tuition and other school fees. The first program we would like to share with you is The Eastside Escalades Basketball Club! Now enrolling for their spring season they have teams spots available for ages 9-12. All teams are coached by professionals. There will be 5 tournaments throughout the April thru early June season and all games are held within one hour of New York City. Open to both girls and boys those who make it to the finals will play in Boston in June in either of the Boy/Girl finals tournament. Practices will be held twice a week at any of the different gyms involved in The Eastside BasketBall program. Whether it be an activity you are looking to enroll your child in for fun or to teach them responsibility and discipline basketball is a great sport. Programs and clubs established like Eastside Escalades are great for the kids within the community. It promotes further participation and also opens up a new door to lifelong friendships. Look into this program or perhaps one near you. Most programs are held throughout the summer which is also great as to keep your kids busy while school is out. A little about hoopin it up. Basketball is for people of all ages. Young, old, novice, advanced, dancing on the court with a ball develops eye hand coordination, cardiovascular health and more. Encouraging our youth to get involved in any team based sport helps to promote positivity in communities around the globe.